Over the past half-decade or so, the Dallas Cowboys have been a perennial underachiever with arguably one of the most talented football teams in the NFL. Coming into this season, the Cowboys were optimistic that this would be the year they could contend for a Super Bowl title and dominate the competition in the NFC East division. With relatively the same team intact and an offense just waiting to explode, the consensus was that Dallas would be a force to be reckoned with, but they struggled early on once again. 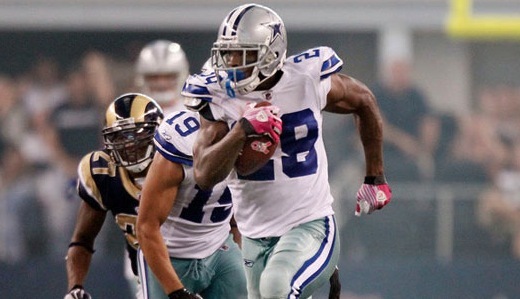 One of the biggest problems that has plagued this Dallas Cowboys’ offense has been the lack of a potent running game. With the Emmitt Smith era long gone, the Cowboys haven’t been able to give superstar quarterback Tony Romo the threat of a dominant rusher coming out of the backfield, but that might have changed over the last month or so with the emergence of up-and-coming running back DeMarco Murray. It is probably still too early to speculate or consider this young back amongst the elite running backs in the NFL, but Murray has played great in the absence of the injury prone Felix Jones. With solid performance after solid performance, Murray has gone from an unknown running back for Dallas and transformed into the undisputed starter. Now that Felix Jones is coming back from injury in Week 11, the Dallas Cowboys had to make a decision between the running backs and no one argued with the fact that DeMarco Murray has earned the starting role out of the backfield. Whether or not this up-and-comer can continue to play consistently well throughout the rest of the season remains to be seen, but as of right now he definitely makes this team better and takes a lot of pressure off of starting quarterback Tony Romo. With the running game firing on all cylinders and Romo finally getting the time to make something happen under center, the Dallas Cowboys have been red-hot with their most recent win over the Buffalo Bills being the biggest and most impressive win of the season. After lighting up the Bills for 44 points, the Cowboys have come into their own and could be ready to live up to their high expectations. In Week 11, the Dallas Cowboys will head to the nation’s capital to face off against the division rival Washington Redskins in what could be a crucial game for Tony Romo and company. At this point in time, the only team in the NFC East that looks like they can challenge the Cowboys within the division is the New York Giants. If the Cowboys can continue to win football games in this fashion and hold off the Giants in Weeks 14 and 17, the NFC East division title will be within their grasp. So as long as DeMarco Murray continues to play consistently well out of the backfield and Tony Romo limits his mistakes while keeping the Cowboys’ offense clicking, the sky is the limit for Dallas as the playoffs seem to be on the horizon.